Just Released! MEMBERS: Login to access member only pricing. Since 2007, NASSP has designated 69 secondary and middle schools as Breakthrough Schools for their dramatic and demonstrated gains in student performance. “Leadership Matters” is an eye-opening report that identifies and unpacks the common skills and behaviors shared by leaders of Breakthrough Schools. 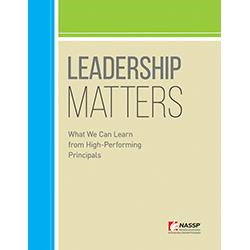 The research offers intriguing insights that will benefit all school leaders, while raising important questions about what it means to be the kind of high-performing principal who is able to create an environment where every student can succeed.